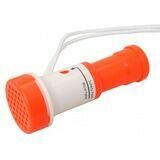 Electric horn with amplifier, suitable for boat sizes from 12 to 20 metres. Easy mounting, only requires for 2 horn wires to be connected into the control unit. Supplied with mirror polished stainless steel bracket. Fitted with voice amplifier device used to transmit vocal messages, automatic fog signal, VHF input. It includes microphone. Electric trumpet horn. Very easy mounting. Includes mirror polished stainless steel bracket. Only requires for 2 horn wires to be connected into the control unit. 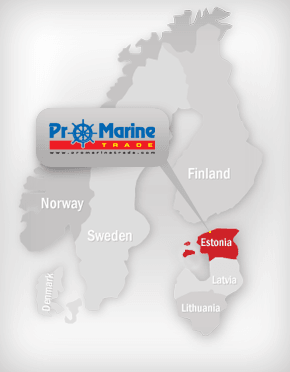 Type approved RINA for pleasure boating and boats from 12 to 20 metres. Length: 249 mm, Speaker diameter: 237 mm. Made of stainless steel. Horn length 400 mm. Volume 112 dB / 370 Hz. 12 V.
Made of stainless steel. Volume 123 dB / 320 Hz. Dimensions: 527 x 203 mm.12 V, 4 A. Chromed ABS body with mirror-polished stainless steel support. Single horn power: 115 + /- 5 dB. 12 V.
Flush-mount horn. Easy and fast mounting, preinstalled gasket, plastic parts, 5-year warranty against UV-ray yellowing. Frame size: 140 x 80 mm; Horn size: 90 x 60 x 95 mm; Power: 115 db. Stainless steel. Flush-mount horn. Easy and fast mounting, preinstalled gasket, plastic parts, 5-year warranty against UV-ray yellowing. Frame size: 140 x 80 mm; Horn size: 90 x 60 x 95 mm; Power: 115 db. 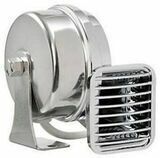 Flush mount foldaway horn. White ABS body, very easy external mounting. Frame size: 110 x 85 mm; Reccess: 70 x 40 mm; Power: 105 db. Light weight but strong ABS housing. Function: Talk/Siren. Sound Coverage: 400 m approx. Power: 20 W. Diameter: 200 mm. Length: 350 mm. 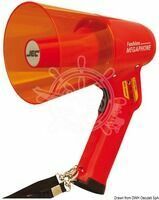 Batteries: 6 x D.
Megaphone with handle and strap, includes fog horn. Easy to use. Voltage: 8 x 1.5 AA-type batteries (not included). Power: 20 W, Length: 250 mm, Mouth diameter: 130 mm, Weight: 0,7 kg. Range: 300 m in urban areas (900 m in outdoor). 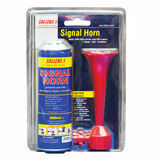 Signal horn set with 380 ml air cylinder. Acoustic range approximately 1500 m.
Signal horn set with 200 ml air cylinder. Acoustic range approximately 1500 m.
Made of plastic. Water resistance, works also when wet. Length: 12.5 cm. Twisted hand pressure fog horn. Made of chromed brass. Twisted hand pressure fog horn. Chromed brass, deep and pleasant sound. Chromed brass "referee" whistle. Powerful ring. Boatswain whistle, nickle plated brass has a deep and pleasant sound. Length: 14 cm. Plastic fog horn, length: 29.6 cm.